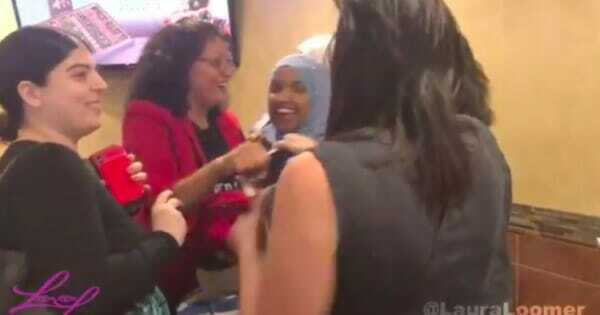 Conservative activist Laura Loomer crashed a campaign event on Sunday for two Minneapolis area Muslim Democrats. Minnesota state Rep. Ilhan Omar, left, and Rashida Tlaib, a congressional candidate in Detroit held a joint campaign event at the Holy Land deli in Minneapolis. Rashida Tlaib will likely be America’s first female Palestinian and Muslim member of Congress. Rashida celebrated her primary win last week by posting a hateful tweet against Israel. Ilhan Omar married her brother in 2009. The two are currently divorced. On Sunday Laura Loomer confronted both of the politicians about their attacks on Israel and their association with the far left anti-Semite Linda Sarsour. At one point in the video Laura asks Ilhan why she married her brother. Laura posted the video on Facebook this afternoon. Facebook took down her account.